Spring Onions or Scallions contains essential nutrients like Vitamin A, C, K, B1 and B2, iron, calcium, dietary fiber. They also help in reducing the blood pressure, cholesterol and glucose levels. 1. Boil the potato, peel the skin and keep aside. 2. Heat butter in a pan. 3. Add the spring onions and garlic. 5. Pour 2 cups of water and simmer for 8 to 10 minutes. 6. Remove from flame and allow it to cool. 7. Add the potatoes and grind to a smooth puree. 8. Add enough water (as required), soy sauce, salt and pepper powder. 9. Stir well and place it over medium flame. 10. Simmer for a few minutes. Note: Instead of potato, you can also add radish. 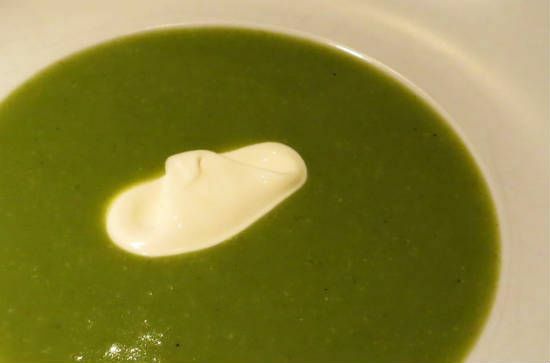 Tip: You can also garnish the soup with a dollop of fresh cream if desired. Feel free to comment or share your thoughts on this Spring Onion Soup Recipe from Awesome Cuisine.